As a story, I wasn't that impressed. The plot line was pretty simplistic and fairly predictable. Only a third of the way through and I already had a lingering suspicion of who the culprit might be. There were also a few unrealistic moments. For instance, when the target is finally revealed, I kept wondering why they didn't just google "Ortolan & video game," a hundred pages ago instead of just "Ortolan." Which by the way is evidenced when Nick says, "We should have done more research...Then we would have found him a lot earlier." Yes, my thoughts exactly. I also didn't feel that much for any of the characters: an eyeroll every once in a while and an exasperated sigh. The pacing was also somewhat slow for a thriller and quite honestly, I felt like it was consuming up too many hours of my time. And when a book makes you wonder if "it is ever going to end? "...well, that's not a good sign. HOWEVER, I really did like the writing style. And while I wasn't impressed by the plot, I was impressed by the way the characters became totally consumed by the game. I'm not a gamer myself so I can't fully understand the draw...but I've always wondered what keeps them hooked. As the story switches back and forth from the gaming world and the real one, I began to get a better feel for what keeps them going. There's the secrecy of the game and its rewards. Once Nick gets his hands on Erebos, he becomes completely consumed by it: just one more level...just one more reward... My favorite parts were when Nick must accomplish a task in "real life" in order to obtain a reward in the game: Nick acts nearly psychotic and desperate. AND I did appreciate the fact that the story is more multicultural than most high school settings. 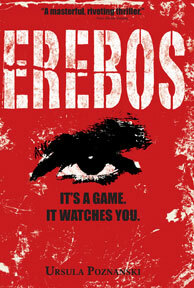 Erebos takes place in London, and I expected a completely homogeneous group of people, so I was pleasantly surprised to read references to descriptions and names from different races. It made London feel so real! But towards the end, I just wanted the story to be over. The romance with Nick and Emily was too forced...like the author just had to make it work. The pacing was too slow for me, and I expected more plot twists and more suspense. Also, I'm a bit surprised that Nick's parents never mention a word to him about Erebos. It is an interesting read but not as entertaining as I would have liked. I would have to recommend this as a "Maybe" read. Heh-I tried reading this...didn't get too far. You'll have to tell me spoilers! Curious but didn't like reading it. The Immortal Rules: Rule #1...Stay Alive.